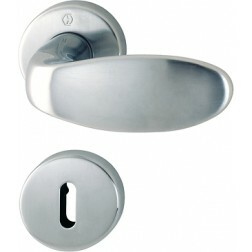 Interior door handle with knob Hoppe Genova series on round rose. 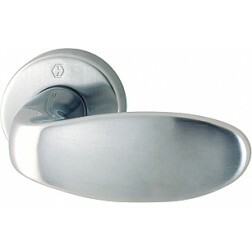 Genova series takes the classical "egg" form, typical of armored door knob. It 'a mix between handle and knob. Made of solid brass and solid return springs ensures a good resistance. Quick-Fit Connection assembly is fast and simple. Both finishes available are protected from wear up to 10 years, thanks to Resista patent .The door handles will be sent in pairs, packed in the original box with mounting accessories included.